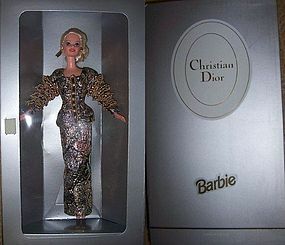 This is a beautiful 1995 Timeless Creations Mattel, Christian Dior, Limited Edition, White Barbie Doll, mint, never removed from box, unused condition in the original box, made by Mattel. This really pretty Barbie Doll has blond hair with a black, gold, silver, beaded gown and gold tone earrings. The box is in very good condition with no damage other than a slight crease line on the side. This doll is from my personal collection. I special ordered her in 1995 from a specialty doll shop in Mechanicsburg, PA. She has been in a closet ever since. We guarantee all items to be as described. Feel free to email with any questions. THANK YOU.